Though Andrzej Wajda, Poland’s most well-known film director is best known for The Promised Land and three other award-winning films, for me his 1990 film, Korczak, has the greatest meaning. Mr. Wajda, who the New York Times called “a towering auteur of Polish cinema,” died earlier this month, so this is a good time to remember him. This French poster advertised the then new 1990 film. The irony is that a French reviewer’s negative article created damage that took a long time to undo. Korczak, starring Wojcieh Pszoniak in the title role and Ewa Dalkowska as Stefa, documents Janusz Korczak’s efforts, twice, to re-create his orphanage in the Warsaw Ghetto after the German invaders forced him out of his building at 92 Krochmalna. Although run-down shells of buildings were a poor comparison to the original home, Korczak did succeed in creating a humane refuge for the orphaned children in his care. 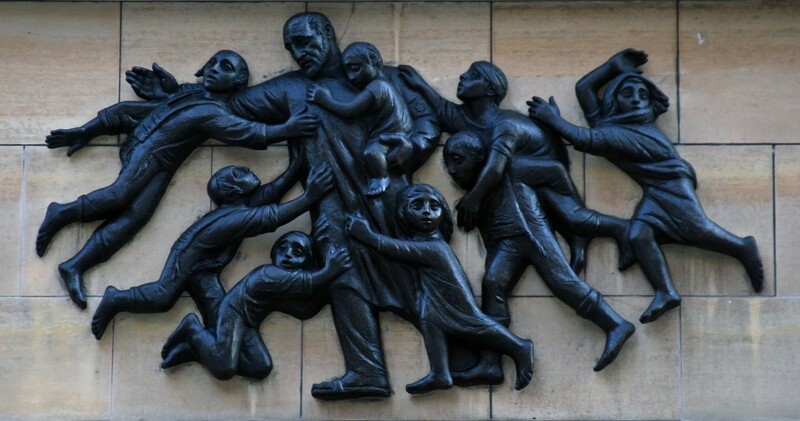 In the hell that was the Ghetto, Korczak continued with his extraordinary pedagogy, children’s self-government (including the Children’s Court), teaching, and mealtimes. Korczak sets out to document the man and his heroic work during his last two years, from 1940 to 1942. “I think I committed to Korczak all my talents and skills,” he said. Like Schindler’s List, this movie was filmed in black and white, showing the stark contrast of good and evil. (Steven Spielberg considers Korczak “one of the most important pictures about the Holocaust.” Noteworthy is the fact that Wajda did not succumb to the temptation of showing the orphans at the Treblinka death camp, claiming he had no right to do so. Andrzej Wajda was born in 1926, in Suwalki. His father, Jakub, was a victim of the Katyn massacre in 1940, the subject of his 2007 film of the same name. In 1942, he joined the Home Army (Armia Krajova), the Polish resistance, of which Irena Sendler was also a part. After the War, he studied painting at the Krakow Academy of Fine Arts, before enrolling in the Lodz Film School. The 1970s was a lucrative time for Wajda, and his 1981 film, Man of Iron, told of a wedding during the Solidarity movement. Andrzej Wajda passed away in October 2016, in Warsaw. He was 90.